A traditional laced waterproof leather paddock and yard boot which is ideal for riding and as yard boot, for stable work. This classical boot has exceptional durability. It is a comfortable durable yard boot for the professional groom and leisure rider. Well liked by endurance riders. If you have very slim ankles, than the Equi-Master will fit better. Size range 2 to 14 incl half sizes. Size 13 1/2 and 14 are made to order only. The Climate Control Technology will ensure that your feet are comfortable as summer as well as a winter boot. COOL feet in summer and WARM in winter.The lining is not thermal but insulative and it makes it an ideal winter yard boot that also can be worn in summer. whatever the weather. This riding boot is well liked by endurance riders. Pound stretcher! 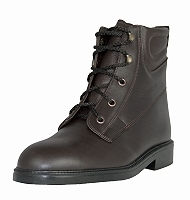 These paddock boots will last 2 - 2 1/2 times to a comparable product. When purchasing yard boots + gaiters you get 5 % discount on both.